This is my second quilt top finish for 2016. 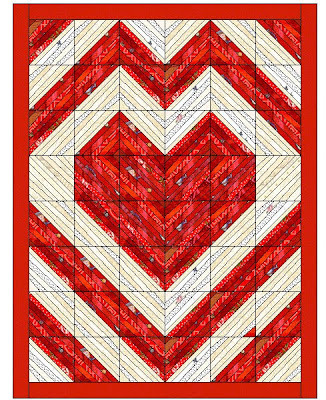 This is my Yes Kevin, I Can Do Scrappy Mystery Quilt named in honor of Kevin The Quilter. You can find Kevin's blog here. This mystery was put together by Ann at Attic Threads. You can find Ann's blog here. I'm really happy with how this turned out. This quilt was made from my stash except for the white jelly roll that I bought to use for the background. I had a couple of Christmas jelly rolls here which worked out really well since all of the blocks were made from 2 1/2" strips. I also added in a bit of my Christmas fabric stash. The clues for the mystery were released once a month, You can still find all of the clues plus the final reveal diagram of the finished quilt at Attic Threads blog. Thanks to Ann for a great mystery! I hope to have this quilted, bound, and ready for display next Christmas. Hello Everyone This is my first quilt top finish for the year. This is the annual mystery quilt that Bonnie Hunter starts the Friday after Thanksgiving. She gives a clue every Friday for about 6 weeks, and by then we have all of the components to put the mystery quilt together. Bonnie gives numbers and colors of paint chips that correspond with the colors she has used in the quilt so you have some idea of what fabric colors to start pulling or buying for the quilt. This is a lot of fun, and I've ended up being a part of a fun sewing bee because of this quilt. I printed the paint chip numbers and headed to my local Lowes to pick up my paint chips so I could be ready to pull my fabrics and sew when the first clue came online. There was another lady there with her printout pulling her paint chips. We both recognized what the other was doing and struck up a conversation. She ended up inviting me to her sewing bee promising me she wasn't an axe murderer. As we talked, I realized that I knew several of the group members already and had known some of them for as long as 15 years. I had been invited to this group before several years ago and didn't go then, so I took this as a sign that maybe I should. I've been sewing with them once a week since then. This quilt (and all of the mysteries) are a lot of sewing to finish during the Christmas season, but you can save and print the clues to work on the quilt later. This is my fourth Bonnie Hunter mystery, and I think this is my favorite! This quilt top is all done from my stash, too!!!! 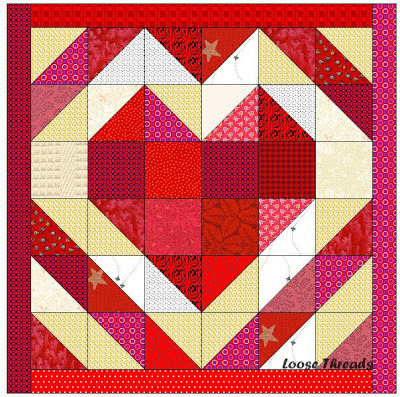 When I posted my Valentine quilts in my last post, I forgot to show you this one. This is one of the Dresden Table toppers I made using my Halloween Dresden Table Topper tutorial here. The complete instructions can be found in that post. I finished sewing the binding at the end of January, so it was ready in time for the holiday. Happy Valentine's Day! I hope you are all enjoying the day. We're waiting for snow today. The weather forecasters have promised us 2-4 inches by tomorrow morning. We haven't had much snow this winter, so I'm kind of looking forward to this one. I love this photo. It was taken at my husband's family farm. I've had the top made for a couple of years. This year I bought the backing fabric. I just bought batting the other day, so maybe by next Valentine's Day I can show you a photo of the finished and bound quilt. The quilt is made from string blocks. You can see my string block tutorial here. My blocks measure 8 inches, but you could make it any size. Here is a close up of one of the string blocks. I quilted this after watching Leah Day's Heart Paisley video. I haven't posted here for awhile. Whenever I land on a blog that goes into too much medical detail, I usually click and am gone pretty quickly. So I'll make it quick. I've had a flare up of Bruxism. That is just a fancy word saying that I grind my teeth in my sleep. I'm not sure what causes it, but the dentist says it's due to tension. This isn't life threatening, but it's kind of painful. For the past 2 weeks or so my head has ached like it has been squeezed in a vice, my jaws ache and feel like they're on fire, and my ears ache. I've cracked a couple of teeth, but nothing that needs to be repaired just yet. So.......I have a splint (it's kind of a mouth guard) that I wear at night, and it's helping. I had the same problems years ago and thought that was the end of it. But, I guess once you are a grinder, you're always a grinder. As he put it, you are going to have to wear that every night as long as you're here. I'm going to have a new mouth guard made so I've got a few more dentist visits ahead of me. So what have I been doing for stress relief? Sewing, what else? I am working my way through some of my UFOs and have several things to show you in my next few posts. Another reason I haven't posted is that I have a new laptop. I love it, and it's great. But, it's taken me awhile to get used to where everything is. With the help of my engineer husband, I think I have finally figured out where my photos go when I put the SD card into the slot on the side of the computer so I can hopefully post more often.